You must make reservations at least 5 minutes in advance of the time at Sundown at Granada. Free valet parking is available in addition to street parking located throughout the area. DART bus (various stops along Mockingbird Ln., Skillman St. and Matilda St.
Nightly music 7 days of the week. We cater to any type of event that you have in mind. From passed appetizers to buffet style and fully plated meals, we are here to accommodate your food and beverage needs for Sundown at Granada and Granada Theater events. Menus and bar packages are available, please contact our events team for more details. Contact us at events@granadatheater.com or give us a ring at 214.827.5514 . Established in 2011, Sundown at Granada is a neighborhood farm-to-table restaurant located next door to the historic Granada Theater, boasting an expansive patio overlooking Greenville Avenue and Sundown's own organic garden. Sundown offers fresh, seasonal dishes highlighting locally-sourced produce and free-range meats. Catering to all different appetites, Sundown has a wide variety of Vegetarian, Vegan, and gluten-free fare. Paired with one of our 60 craft beers or a refreshing craft cocktail and our scenic rooftop patio, there are tastes for every palate! In addition to delicious food and craft cocktails and beer, Sundown also doubles as a music venue and event space, hosting live music six nights a week. Sundown is locally owned and operated by Mike Schoder and Julia Garton. The food was good but the service was horrible. 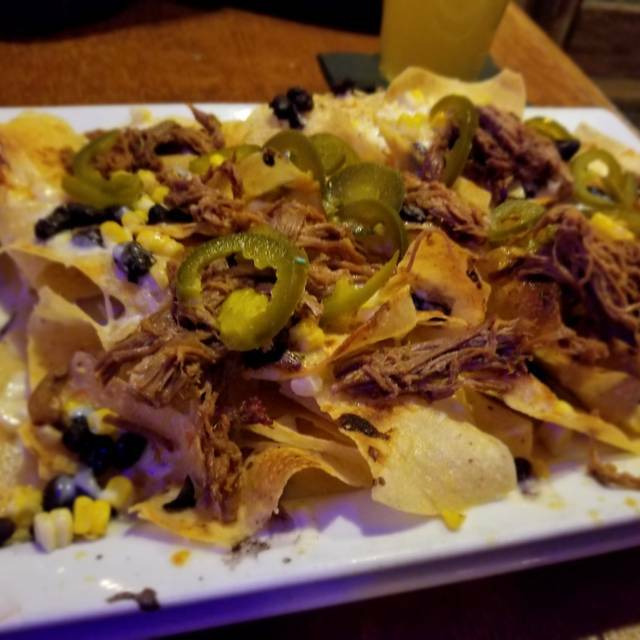 We had to run down our waiter to get our chips & queso, the menu was out of date, it took nearly 90 minutes to get our dinner - nothing more difficult than hamburgers & meatloaf - and we never got our last round of drinks, in a nearly empty restaurant. On top of all that we had to wait nearly 20 minutes for the waiter to fix a wrong bill. It would have been easier and quicker to sit at the table and Uber eats food from another restaurant. Terrible, avoid this place and spend your money elsewhere. Besides the super slow service, our food was flavorless and way overpriced. We ordered an assortment of items from the menu, including a vegan option. The brisket was dry and tasted old, the vegan patty was like eating cardboard. It is not farm to table as advertised, more like farm to week old produce at a grocery store to a table at Sundown at Granada. So very disappointing. I guess if you are super hung-over you may enjoy the overpriced flavorless food offered here (I assume this is the only way this place has some good reviews.) horrible, terrible, so angry we wasted our time, money and calories here. I would only recommend it to certain friends. The young hipster types.... The website had really good pics but did not specify it has two floors. So my grandmother did not get to see the open mic night, which is why we went there. First time here and did not have a good experience. Terrible service (watched one table walk out after not getting water or menus for 15 minutes). Food was either over cooked or cold. No consistency and just overall not a good spot other than location. Would recommend another spot on Greenville. We went to brunch here while visiting from San Antonio, and the service was excellent. I got a salad with a burger patty on top, and when the burger wasn’t cooked as ordered, they quickly got me a new one and didn’t charge for that entree. The drinks were very reasonably priced, and the outdoor seating was perfect for a sunny day. Fabulous food and service! Will return and recommend for sure! Sundown is the absolute best place to go before a show at the Granada Theatre. Great food, great drinks, and if it's busy they have valet that you can keep after you visit Sundown while you go to the theatre. This is a great place to eat prior to a show or concert at the Granada. The food is locally sourced, small plates, and well made. The bar was less than great, as I asked for a specialty drink with less sweet prickly pear, and the bar ignored the request. I would not go out of my way to eat here but I will return if I go to the Granada. Casual valentines dinner before going to a haunted house. Great atmosphere and delicious food! A locally owned and historic neighborhood gem. That alone makes it special and worth the price of admission, but the well thought out dining and theater synergy, combined with excellent food and friendly service, always make for a remarkable evening. Loved it! Wonderful food, drinks and service. Fantastic service and the food was delicious. My friends and I loved the feel of the outside patio. We could hear the music, but still visit. I would recommend Sundown! Restaurant did not honor reservation and kicked us out when we were there to celebrate my wife’s birthday, even though we confirmed with them on the phone over a week prior to the reservation. We will never use open table or eat at Sundown at the Granada ever again. Great food and great happy hour! Easy to park and very convenient if attending a Granada Theater show. Highly recommend! I had the bison meat loaf which was very good as were the carrots. The mashed potatoes tasted like warm glue. the stuffed avocados were amazing. We had a party of 10 and everyone was pleased with their drinks and meal. This was our second time to go to Sundown prior to a concert at the Granada. We were in a party of 6+ for each visit. We were seated at the same table each time, which is on the patio. Both concerts were in the winter, so it was enclosed. This particular table is seated directly under the heater, so at times, it was very hot, and when we said something, they turned the heat down, then it got cold. They need to find a way to more evenly distribute the heat, and probably a/c in the summer, so their customers don't get too hot or cold. Other than that, it's a great place! The food was great with very classy and friendly service. Our server was attentive and the seating was very comfortable. The food was delicious (ahi tuna tacos) and dessert just as good. We were even treated to live music and people were swing dancing. Great atmosphere and wonderful ambiance. Good for date night or a girl's night! Wasn't busy & easy/quick for brunch on a Saturday afternoon. Wasn't getting busy until after 2pm. We sat on the patio during a sliiightly chilly evening directly underneath their heater, when we asked to turn the heat down a bit the server was extremely polite and courteous. She made sure we were comfy and well taken care of! Stellar service and pacing. Great! Easy to order and just a great place to hang out! Everything was soooo good! Can’t wait to go again. The chipotle marinara the Texas meatballs came in was incredible!!! Went here with 4 friends for my birthday. Great service, food, and atmosphere. Couldn't ask for anything more. Fun menu and good vibe. Great food and good service. Plenty of options and good beer selection. Would recommend it anytime but especially before a show. There were four of us, and we ordered several appetizers and other dishes to share. The menu has a lot of unique things and everyone wanted to try as much as we could. My taste buds were happy, and I left feeling satisfied. Nothing we ordered was disappointing. 5 friends and I celebrated a friend’s birthday. The service and food was great! Dine and skip the line is an awesome feature! Call in advance to verify your show will allow the wrist band option. My colleague and I were just in town for a short work trip. Immediately upon landing, we did a quick search for nearby organic/farm to table restaurants. We were drawn to Sundown by the great look of the restaurant, as well as the photos of food. We were not disappointed. So so GOOD. Will definitely be back if we're ever in Dallas! We had tickets to the Granada so choose Sundown for dinner. It’s was very good. Service was great. Food delicious, drinks at happy hour very reasonable. The manager came to our table for a visit and validated our Granada tickets giving us wristbands to go right in. Will definitely go again. We dined prior to seeing Billie Eillish show at the Granada. Not only was the food and atmosphere great, The staff took care of checking us in for the show! We we’re able to enjoy ourselves and relax making our evening perfect. Fun. Good atmosphere and service.